Speaking to Muslim clerics in the Russian Urals city of Ufa on Saturday, President Dmitry Medvedev admonished attempts to spread racial hatred in Russia ahead of the important political events there. All such attempts should be severely punished, Medvedev warned, citing the country’s legislation that he said should be used with respect to all Russian regions, including the Caucasus and the Far East. 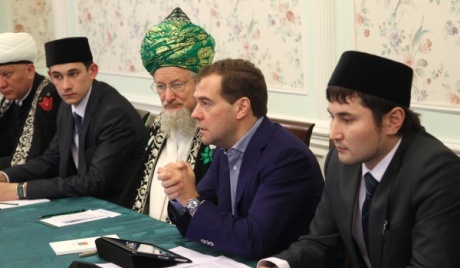 "Ideologically, traditional Islam-leaning clerics are able to combat radicalism and extremism," Medvedev says. "Actually, being in the dark on the ABC of religious culture makes a young man vulnerable to extremist trends. Religious illiteracy is fraught with serious repercussions in a person’s mind and actions," Medvedev warns. Offering full-fledged religious education may well help resolve the problem. The Russian government will allocate nearly one billion rubles, or more than 300 million dollars, for the training of Islamic history and culture specialists over the next three years.